Claims follow up: Claims can be corrected and re-billed or appealed. Knowing payer guidelines would also limit the amount of charges written off. Insurance verification: Insurance can change or terminate at any time. It is important to verify insurance benefits every visit. Failure to manage denials: Keeping track of denials are a great way to find trends that can help prevent them in the future. Physician Practices can spend more time focusing on patient care and patient satisfaction. This is specifically advantageous for smaller physician groups that cannot afford a large medical office staff. Physicians cannot be efficient at providing excellent patient care if they are bogged down by the financial side of the revenue cycle management. Our team consists of dedicated highly trained specialist whose primary function is to increase the profitability of your practice. Our goals are directly aligned with the goals of the practice, if the practice does not make money, we do not make any money. We only charge a percentage of the money that we collect on. 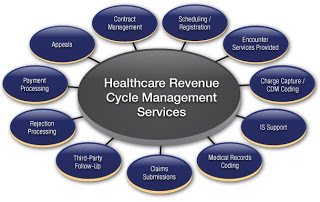 We provide meaningful financial reports with real time figures on A/R periods, revenue collection, common rejection reasons associated with payers. Medical practices are able to review their monthly reports to see at a glance, the health of the practice. We conduct a fee schedule analysis to make sure that you are getting reimbursed at the highest possible rate for your carriers. We utilize multiple claim scrubs to ensure that claims are submitted correctly, utilize efficient policies and procedures to reduce your cycle time, and review denials for accuracy. Our Revenue Cycle Solutions Processes have proven to reduce costs to collect by 10% to 20% while consistently maintaining cash levels at or above 100% of target. Our success rate has been proven to increase struggling practices collection rates by 120% while reducing the number of days in Accounts Receivables. Our expertise lies in tracking and trending denials. Our denial management services include identifying key problem areas by payer and reason, tracking overturn ratios for cost benefit assessment, potential variances, and unreasonable payer practices. It’s not just about years of experience, but about the relationships we have built with Commercial and Medicaid payers that will prove invaluable when submitting claims and resolving disputes. To allow Electronic Remittance Advice (electronic EOB’s) files to be posted with insurance payments, adjustments and denials. To ensure claims contain all required information prior to submission to the payer. This will flag accounts that may be missing important information specific to certain payer guidelines. To allow providers to evaluate expected reimbursement against actual reimbursement for payment review. Knowing whether claims are paying according to contract can prevent lost revenue. To allow the scanning of insurance cards and other billing information allowing staff in different locations access the same information. To evaluate revenue cycle performance, providers can generate reports such as revenue and denial reports. Reports to detect and track certain trends to assist in maximizing performance.